Createspace Independent Publishing Platform, 9781507551967, 242pp. No YouTube. No smoothies. No Manga. Not ever again. Unless Pete figures out how to reverse his bad spell and free Weasel and him from the past. A young wizard accidentally opens a time lock and he and his bookish friend are swept into Victorian England, where they will be trapped forever if that wizard-in-training can't find a way to reverse his bad spell by the next full moon--just three days away. One of this book's Five Star Reviews: "This was a spooky fun adventure filled with creepy folks, loyal friends, on-the-run suspense--all wrapped up in super cool time travel!" In my other life--the one before I began writing for teens and younger readers--my field of Linguistics and Inter-cultural Communication carried me to a lot of places in the world to explore different cultures and languages. I can say, "Where's the toilet?" and "I'm lost!" in at least five languages and two dialects. My idea of a perfect day is one or all of the following: writing a new story, reading a blockbuster novel, hiking on a misty morning trail, or swimming in an ocean someplace. 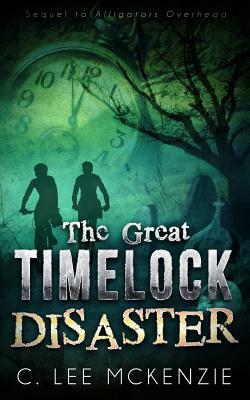 The Great Time Lock Disaster is Book #2 and follows Book #1, Alligators Overhead. Book #3 Some Very Messy Medieval Magic arrives spring 2108. Another middle grade book is Sign of the Green Dragon, and I have four Young Adult novels: Sliding on the Edge, The Princess of Las Pulgas, Double Negative and Sudden Secrets.